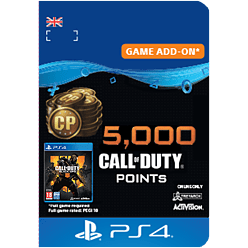 Call of Duty® Points (CP) are the in-game currency that can be used in Black Ops 4 to obtain new in-game content for use in Multiplayer, Zombies and Blackout game modes. Please Note: Call of Duty®: Black Ops 4 game required, sold separately. 2. Go to PlayStation™Store on your console or via our website. 3. Select the “Redeem Codes” option (for PS Vita, ﬁ rst tap the Options icon at the foot of the screen).